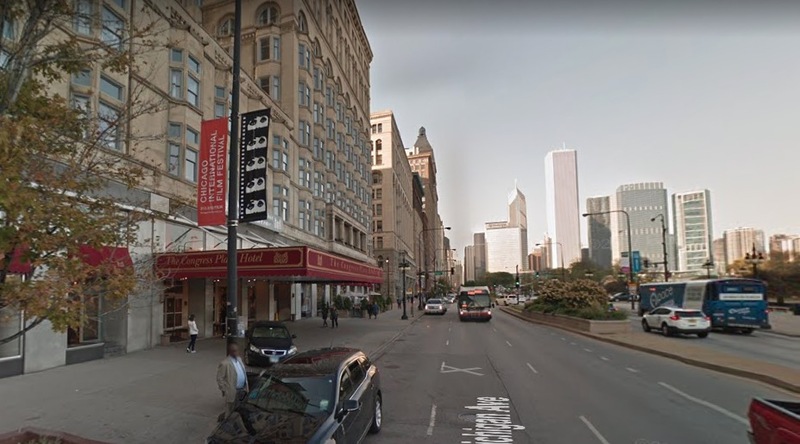 Four men were shot, two fatally, when someone started shooting during an altercation inside a moving car in the Loop late Sunday night, police said. No one is in custody. Five adult men were riding southbound in the 400 block of South Michigan when an argument broke out among them around 11:55 p.m. Police said the confrontation escalated and gunshots rang out, leading to four of the occupants being struck by bullets. The 29-year-old driver lost control of the car and crashed into a pole after he was shot in the shoulder. The car flipped upside down and two men with less-serious injuries ran into the Congress Hotel at 520 South Michigan Avenue to get help, police said. A 31-year-old man was pronounced dead at the scene with a gunshot wound to his face, according to police. A man whose age was not known was pronounced dead at Northwestern Memorial Hospital with a gunshot wound to his head. A second 29-year-old man also suffered a gunshot wound to the shoulder. Finally, a 39-year-old man was taken to Stroger Hospital for neck and back injuries that were suffered in the car crash. He was not shot. All of the surviving men were listed in “stable” condition by police. Investigators said early Monday that the men had given conflicting accounts of what happened inside the car, which has hampered the investigation. Two guns were recovered at the scene. A CPD source said that only the 31-year-old man who died is “known” to investigators.